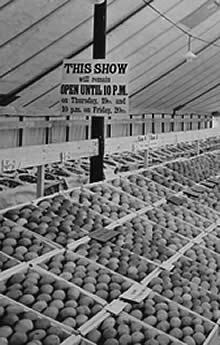 In 1933 thirty-five top-fruit growers decided they wanted to improve the quality and packaging of their crops. 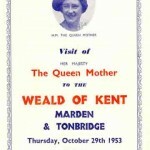 They founded the Marden Fruit Show Society and held their first competitive event in the October. It was held at Walton Hall, Pattenden Lane, owned by Tom Walton who was a fruit salesman. The prize fruit would be sent by train to be displayed in Selfridges in London. Apart from the Second World War and a couple of frosts (which kills the blossom) the Society has organised the Shows annually ever since. There are at least three current committee members who are grandchildren of founders. 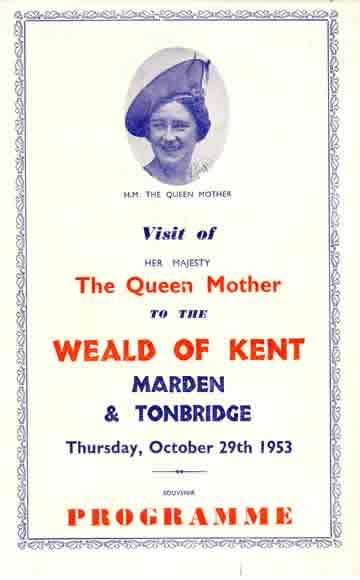 In 1953 there was a royal visit to the Show when the Queen Mother came as part of a tour of the Weald of Kent. We can get a flavour of this important visit from the programme. (Click on the thumbnail pictures to see more). Success has since forced the Show to leave Pattenden Lane and move to the larger space of Kent Show Ground, Detling. Entries come from any of the fruit growing areas of England and from across the Channel. It’s well worth a visit to see the highest quality fruit to be found anywhere – apples, pears and now cherries. A quarter of a mark can make the difference between a winning entry and the runner up. After Detling, the Show is dismantled and usually taken to a well-known spot, eg. Downside Abbey or a stately home and set up for another couple of days. After that the fruit is sold.